A lot of people are under the misconception that fish is hard to cook, and consequently only order it when they are out at a restaurant. I used to be one of them. However, fish- especially this recipe- can be one of the simplest (and healthiest) dishes to make! This recipe for Greek Festival Fish is bursting with Mediterranean flavors, and literally consists of throwing a handful of ingredients into a foil-lined pan and sticking it in the oven. 20 minutes later, voilà! You have yourself a light, tasty meal rivaling any restaurant equivalent. 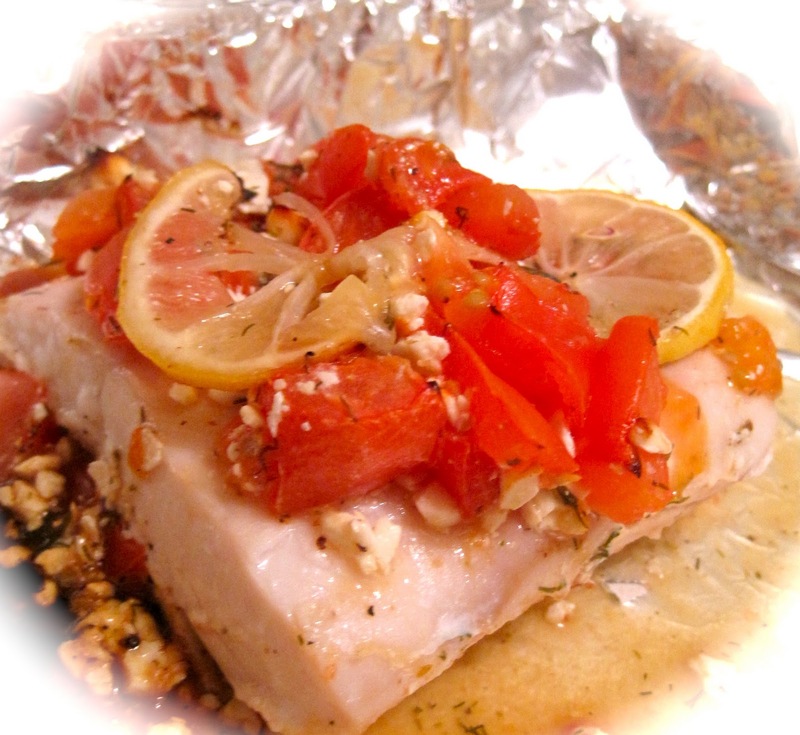 I used mahi mahi, but any white, flaky fish will work well for this dish. The American Heart Association recommends eating at least two servings of fish a week. High in protein and omega-3 fatty acids, fish avoids the saturated fats found in other types of animal proteins. By cooking it yourself, you can avoid the excessive butter and oil potentially used in restaurant preparation. A light sprinkling of olive oil, lemon juice, oregano and dill bring out the best of the mahi mahi in this recipe, and goes wonderfully with a full-bodied glass of white wine. Greek Festival Fish (loosely derived from Greek-Style Mahi Mahi from epicurious.com). I nixed the mayo in this recipe, and substituted lemon juice for the red wine vinegar. Also, I used dried oregano instead of fresh mint. Most importantly, the only olive oil I used was to lightly coat the bottom of the foil. The juices that form at the bottom of the pan after the fish is cooked through form a wonderful sauce that can be poured on top afterward. 2. Toss together tomatoes, lemon juice, feta, oregano, dill, salt, & pepper in a small bowl. 3. Line a small 4-sides sheet pan with foil and lightly oil. Put fish (skin side down if skin is attached) on pan and season with 1/4 tsp salt & pepper. 4. Spread tomato and feta mixture over the top of fish. Put 2 lemon slices (slightly overlapping) on center of each fillet. 5. Broil fish 8 inches from heat until just cooked through, 14 to 16 minutes. If topping browns before fish is cooked, cover loosely with foil. 6. Pour leftover juice in foiled pan over fish before serving. Epicurious.com is my go-to guide for when I know what I want to cook but need to find a recipe for it. "Celebrating food for 15 years", this Conde Nast online database hails from Bon Appetit, Gourmet, and SELF. It also has an interactive online community where you can create a profile, tag favorite recipes, etc. (and you lucky iphone users get your own epi app!) My favorite thing about the site, however, is the search filters: not only can you search by ingredient, but you can then narrow your search down further by reader ratings, healthy, meal, quick & easy, etc.